Over the last few months, I've observed a trend among several well known photographers. No longer satisfied with crop factor cameras or even 35mm equivalent full frame digital cameras, more and more photographers are jumping to digital medium format. What are the advantages offered by digital medium formats, and will you be using one anytime soon? Read on to find out. First of all, let's take a look at what exactly digital medium format cameras are. The truth is that it's all about the sensor. All things being equal, a larger sensor can allow for higher quality imagery. What separates your cell phone's camera from your SLR? Besides the optics and other supporting hardware, the major player is that your cell phone manufacturer can't shoehorn in an SLR sized imaging chip to a pocket sized device. To help visualize the differences in sensor size, I put together this chart with the help of camera manufacturer Phase One's website. The three cameras at left are digital medium format sensors, and the last sensor illustration gives you an idea for scale's sake. For top notch professionals, it's no secret that the quality of their craft is not determined entirely by the gear being used. Their images are strong because of their knowledge, dedication to their artwork, and experience as a photographer. However, photographers with the budget to do so are inclined to gain any step up to elevate their work to the next level. As more and more photographers make news by switching to digital medium format cameras, your interest may grow in the differences between standard digital SLRs and larger sensor offerings. Digital medium format brings to the table a set of advantages that continue to attract photographers. Let's take a look at a couple of them. For many photographers, it's all about the files themselves. They will sacrifice most anything else in a camera as long as it helps to improve the final product. When we talk about the advantages offered by digital medium format, this is the paramount point to consider. Although traditional SLR manufacturers are pushing hard to catch up in terms of resolution, the top of the line digital medium format cameras are currently unmatched. Consider the flagship offering from Phase One, the IQ180. 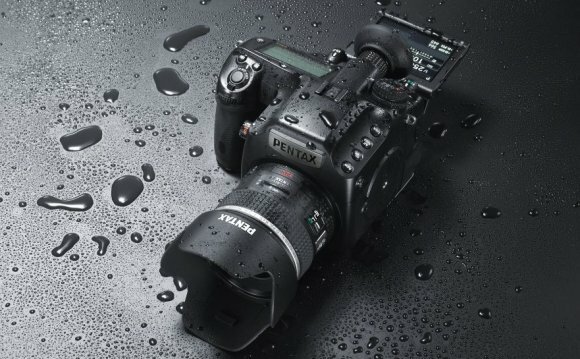 This camera packs 80 megapixels onto the sensor, better than twice the top digital SLR cameras. In this 31 megapixel image provided by Hasselblad, it is easy to see the power of digital medium format. On top is the entire image, and below is a 100% crop of the massive image file. Notice that the photo holds its clarity and detail despite being such a relatively small portion of the original. Does everyone need this image? No. However, those shooting the major ad campaigns and producing images at huge sizes will benefit greatly. Bidding on commercial projects is an intense competition and being able to offer something over others is the type of advantage that gets photographers hired - fairly or not. Also, being able to crop down an image to extreme proportions and still being able to resolve fine details is no longer a pipe dream with cameras of these proportions. The inspiration for this article was two of my favorite photographs blogging about their recent switch in formats. Although I had been familiar with digital medium format in the past, the migration of David Hobby (of Strobist fame) and Zack Arias (he of Onelight acclaim) have recently shared the details of their switch to a large sensor camera. If you are familiar with the work of Arias and Hobby, you may know that their work frequently involves the use of flash. Given the advantages of strobes with digital medium format, it's not hard to realizes what they were thinking. As you may already know, cameras have a "sync speed". This speed is the fastest shutter speed at which the camera can use strobe type flash units. On many SLR's, this top shutter speed is somewhere in the neighborhood of 1/160th of a second to 1/250th of a second. There are some technologies that help us to bypass this limit, but often times, the flash units lose power. This is a photo from an article that I wrote about the use of flash. In this photo, you can see what happens when the flash sync speed is exceeded - we get a cutoff portion of the image. With a much higher sync speed in digital medium format cameras (many as high as 1/1600th of a second or 1/2000th, versus the standard SLR range of 1/200th) you are unlikely to encounter this effect. With many digital medium format cameras, these technologies are unnecessary, as the cameras do not suffer from the same type of sync limitations that SLR's do. The leaf type shutter is more apt to sync, even at high shutter speeds. If using flash and maintaining shallow depth of field is a key part of a photographer's look, the removal of this limitation is absolutely game changing. As mentioned above, David Hobby and Zack Arias have both blogged in the last month about their switch to digital medium format. Both are highly successful working photographers, as well as dynamite instructors. Here is some insight that they shared on their switches to digital medium format. "The bigger individual pixels offer twelve friggin' stops of dynamic range, and suffice to say noise it not an issue. This is not a high ISO camera, at all. But it shines in the types of conditions in which I want to use it. You can even make a one-hour night exposure without noise."